"Kathy and Mark make you as safe as one can be in the mountain, though they make you feel responsible. They make every step totally enjoyable. How could I have survived three nights at 21,000 feet on Ama Dablam, or the final 80° ice climbing on Alpamayo, or my frozen fingers on the East Buttress of Mt. Whitney, without their kindness? And, from 14,000 to 20,000 feet (and perhaps above) Kathy's cappuccinos are the best!" As independent guides we feel we have the freedom and the ability to provide uniquely rewarding climbing experiences for our clients. We value the personal relationships we form with our clientele. This aspect of our work is supremely important to us, and keeps us excited about guiding as a lifelong career. Most of our work is return business, and many of our guests climb with us on a regular basis. We keep our groups and climber-to-guide ratios small. We consider the impact on the safety and flexibility of the group above all when we decide on a maximum group size. Everyone knows that large groups and large climber-to-guide ratios are what make money for a guide service. But we feel that larger groups and ratios compromise the safety, enjoyment and success of individual participants. Just as important, they compromise our own safety and enjoyment of the trip. We are in this job for the long term, and can't afford to cut corners which erode our happiness and effectiveness in our work. We emphasize custom trips to locations in which our clients are particularly interested. Many of our trips are planned in response to requests by individuals or small groups who wish to go to a specific peak or area. We guide our trips ourselves. We prefer to be 100% responsible for the success of our trips. 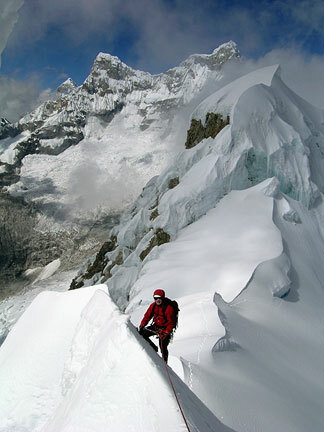 We feel our own experience climbing and guiding in so many parts of the world, uniquely qualifies us to decide how best to conduct our programs. We work constantly to maintain and upgrade our own skills and qualifications. Our work with the American Mountain Guides Association teaching guides training courses helps us keep abreast of new developments and skills in all disciplines of climbing and guiding. Our work for other guide services around the country helps us to learn from the influences and ideas of other skilled guides from many different areas and backgrounds. In the past several years we have worked for a number of other guide services, sometimes operating their own programs, sometimes bringing our clients to them and occasionally conducting guides training programs for them. We continue to pursue our own formal training. Quality guide's training courses, such as those offered by the American Mountain Guides Association, or other internationally recognized guide's associations are expensive and require a big investment of time, money and effort on the part of the guide. We have chosen to make that investment in our own professionalism, and in our profession.